Old school facility in nice shape. Classic lobby bar. Great location a block from the park. Superior staff, superior property. Always a very pleasant experience. Felt like home, staff was wonderful not to large just perfect, very comfortable. Nice hotel with great location. Close to the Park, high end stores and many dining options around. Bar is very nice but tiny and a bit pricey for average drinks and wines by the glass. Staff is amazing and room service is fantastic. Would stay again for sure. Pleasant stay in NYC; quiet tree lined street with very gracious staff. Service excellent. Staff very gracious and helpful. A beautiful hotel with professional and friendly staff. This was our second stay in the hotel. We find the staff to be warm, welcoming and very helpful. The rooms are lovely and very comfortable. We like the location very much. The restaurant breakfast is a bit pricey ... but what hotel breakfast isn't. However, this breakfast is good and portions are generous. Valet parking is prompt and courteous, but quite expensive. If you can forego a car, do. Cabs are generally easy to get in the area. Our only disappointment was that there is no complimentary coffee or tea service in the lobby as we have found at a number of other hotels. We were in NYC during some very frigid weather and such an amenity would have been nice ... and in keeping with the otherwise classy style of the hotel. As it turned out, when leaving for home by car early in the morning and looking for coffee/tea to take with us, we were directed to the hotel restaurant, where we were charged over much for a cup of coffee and a cup of tea. We were surprised at the cost and thought the hotel --otherwise very classy -- would have sent us on our way with a complimentary coffee/tea. Maybe our expectations were high due to the overall tone of attentiveness that pervades the hotel and its operation. This is a small thing in the larger context of a very pleasant stay. I am sure we will stay here again. the staff was very friendly and very accommodating, Jonathan was amazing took great care found and booked wonderful restaurants for us. the only thing they said the have a taxi 10 blocks radius free of charge it was never offered and the car was pricey they sent to pick us up from the airport we had to wait 1 hour for our ride i felt they could of lowered the price for the delay....free drinks something. We loved our experience and will be back. The staff was gracious and helpful, our room was cozy and pretty and the ambiance was inviting and gorgeously appointed. Merci Beaucoup Plaza Athenee! The place really is OK. Staff is pleasant. Service in bar and restaurant on the slow side. You keep wondering what takes so long about making an omelette and 2 poached eggs if there is hardly anyone having breakfast as late as you do... Rooms could use better care. Nice to have marble vanities. Not so nice if they partly fall apart and nobody takes care of it. Same about door frames. Furniture has damages by being hit by something or other furniture that‘s too close to it (bed and desk for example) -Nothing serious... but things that shouldn’t happen in this star- and price-range. That‘s kind of disappointing. Other than that it‘s a pleasant place to stay. Same as above; Doorman, Reception desk and check in people were great and helpful with wonderful demeanors. But the room was WAY smaller than depicted in the photos online, linens were dusty and smelled of old moth balls, and the mattress was an old 80's style spring form that caused me severe back pain for the whole weekend. Never again will I stay there. Never. Located in the delightful upper east side, this hotel is wonderful! Will stay again soon!! beautiful hotel, great location, friendly staff. I will definitely go back to this hotel!!!! 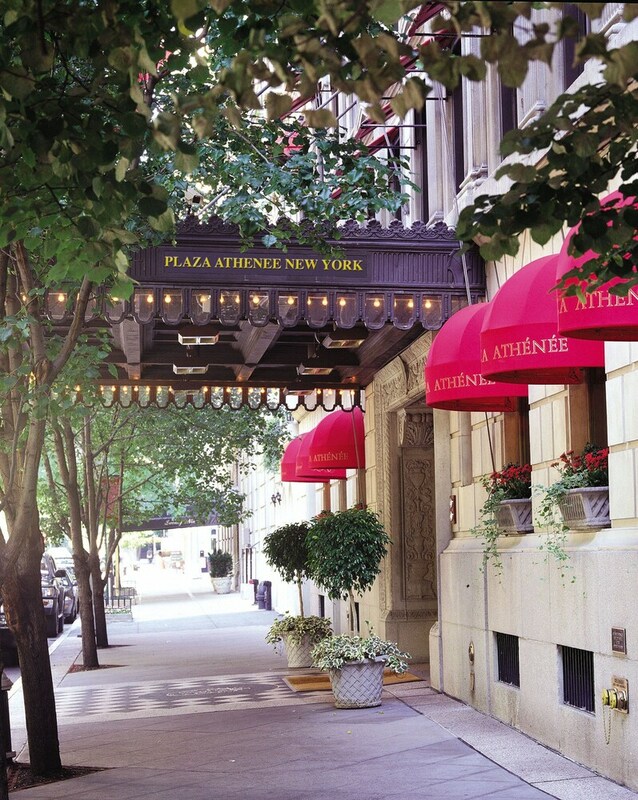 Located in Upper East Side, Hotel Plaza Athenee is next to popular attractions like Central Park and Madison Avenue. This 143-room, 5-star hotel has a restaurant, a full-service spa, and a 24-hour fitness center. Explore the hotel and meet new friends over drinks at the bar/lounge, or enjoy a bite to eat at the onsite restaurant. Order from 24-hour room service to satisfy your hunger without leaving your room. Continental breakfast is offered for a fee each morning from 6:30 AM to 11:30 AM. An LCD TV comes with cable channels and pay movies, and guests can stay connected with free WiFi. Beds sport premium bedding and the bathroom offers a hair dryer and designer toiletries. Other standard amenities include a minibar, free newspapers, and a safe. Guests staying at Hotel Plaza Athenee enjoy access to a full-service spa, a 24-hour fitness center, and free WiFi in public areas. Valet parking is available for USD 85 per day, and there's also limo/town car service. Multilingual staff at the 24-hour front desk can assist with securing valuables, tours or tickets, and luggage storage. Other amenities at this luxury hotel include a conference center, a business center, and a computer station. great staff and location. quiet. Continental breakfast is served daily from 6:30 AM to 11:30 AM for a fee. Recreation features at Hotel Plaza Athenee include a 24-hour fitness center.